Lt. Governor Kim Reynolds and Radio Iowa’s O.Kay Henderson. Lieutenant Governor Kim Reynolds today said she and Governor Branstad have had an “excellent working relationship” and she’s prepared to take over as the state’s chief executive when Branstad leaves to become the U.S. Ambassador to China. An outline for the transition of power is being developed, but there’s no date set for Reynolds to take the oath of office and become Iowa’s next governor. Reynolds said she’s working with Branstad and the entire “team” in their office to put together a package of recommendations for the 2017 legislative session. And it will be Branstad who’ll deliver the annual “Condition of the State” message to legislators in early January and present a state budget outline for the coming year. “Once he is…confirmed by the United States as the next ambassador to China, we’ll take a look at where we’re at and more forward from there,” Reynolds said. 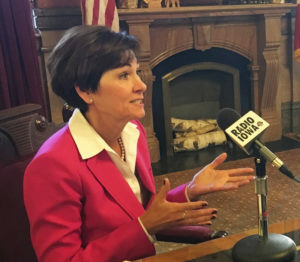 As for whether Reynolds might make significant personnel changes in state government, she said this is “just the second day” after confirmation of Branstad’s exit and her pending elevation to the governorship. Reynolds isn’t ready to say who she’s considering to invite to be her lieutenant governor once she takes the oath and is Iowa’s 43rd governor, but she has “a lot of individuals” on her list. Reynolds said she’s looking for “good chemistry” since she will consider her lieutenant to be a governing partner. After 42 previous governors who were men, Iowa’s 43rd will be a woman and Reynolds hints she’ll run as an incumbent in 2018 — to become the first woman elected as the state’s governor. “Honestly, right now we’re preparing for the legislative session and really putting our program together and looking for ways that we can continue building on what we’ve done and my goal is to be a part of that for a long, long time,” she said. Reynolds served in local government as the treasurer in Clarke County before a two-year stint as a state senator, then she accepted Branstad’s invitation to be his lieutenant governor running mate in 2010. She’s the fifth woman in a row to serve as Iowa’s lieutenant governor. Until 2014 — when Joni Ernst was elected to the U.S. Senate — only the states of Iowa and Mississippi had never elected a women as governor or to federal office. “I’m really proud to have the opportunity to be a part of history,” Reynolds told Radio Iowa. 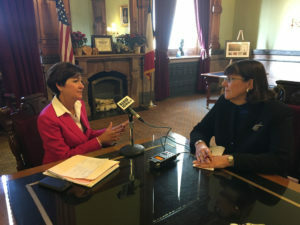 Not only is Ernst the first female senator from Iowa, but Reynolds pointed to Linda Upmeyer, who last year became the first woman to serve as speaker of the Iowa House. “Probably the majority” of state agency directors are women, too, according to Reynolds. Reynolds, who is 57, is a native of St. Charles. She and her husband live in Osceola.